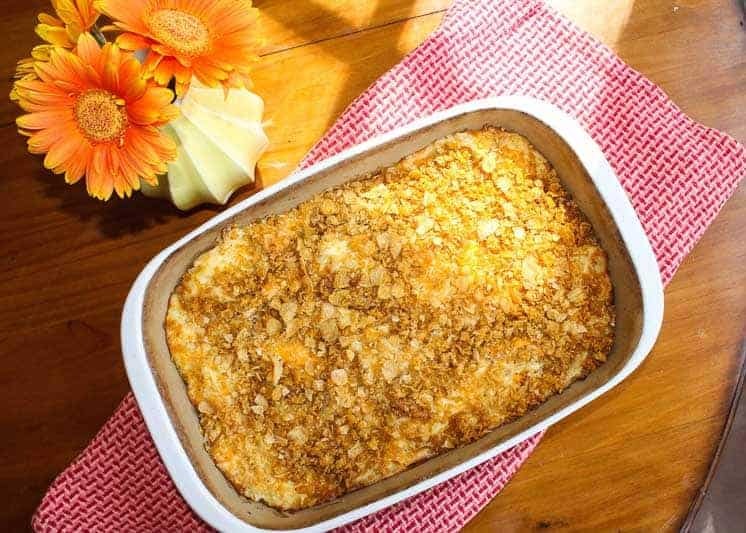 This is easy Hash Brown Casserole Recipe is a treasured family recipe from my Grandma Kriz. The topping is crunchy and the filling is cheesy creating a delicious side dish for breakfast, lunch, or dinner. My love for food began with my Grandmother, Bonnie Kriz, aka Grandma Kriz. I grew up and currently live in Fayetteville, North Carolina, but my summers as a child were spent in Oshkosh, Wisconsin where the majority of my family live. Every summer, my mother would pile my brothers and I in the car for a 22 hour drive road trip and the four of us would stay with my Grandma and Grandpa Kriz. Meal time was important in the Kriz household. Grandma made everything from scratch. She spent the afternoon preparing her meal for dinner time. Often I was the lucky tester. She would let me taste test to see if her dishes needed anything added to it. When I wasn’t asked to taste test, I would sneak a bite. Grandma would say, “Now you keep out of that. That is for dinner tonight.” And I would go right ahead the minute she wasn’t looking. My grandma is a little tiny lady that demands big authority. You risked your fingers getting cut off if she caught you. But her dishes were worth the chance. 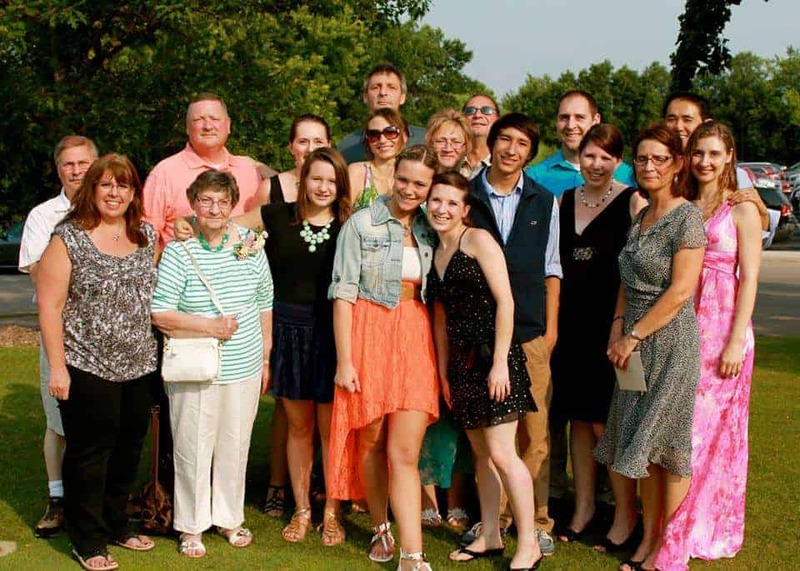 Grandma Kriz is the little lady surrounded by several Kriz Family members. My Grandma wasn’t terribly big on the cookbooks the way I am. She has a few of her favorite books that she would use from time to time, but several of her recipes came from the newspaper. She loved skimming the newspaper and clipping the recipes. She also had numerous hand written recipes she copied from family and friends. The recipes that she continues to cook today and have been passed down from family members are my favorites. She filed all of these recipes neatly in a big filing box for easy access. My Grandma is a picky eater and a picky cook. She would try “no” funny stuff. She hated spicy food. It drove her crazy that I loved spicy food. Where most kids went through a phase where they put ketchup on everything, I put hot sauce on everything. She would say, “You are going to rot your stomach out.” If you could not pronounce an ingredient, she was probably not going to dare try it. She is a Greek lady who does not like Greek food other than maybe the sweets like Baklava, powdered sugar cookies, and butter cookies. She thinks I am crazy for eating all the foods that I eat. I think she is crazy for missing out on the good stuff. And how can you be Greek and not like Greek food? As I became an adult, I tried to cook for her from time to time. She would tell me, “Well that depends what you are making.” There was no tricking her. She eyeballed my ingredients and if there was something she didn’t like, she wasn’t going to try it. She is very stubborn. There is no arguing with her because she will win. Even though her palate is smaller than mine, her meals were some of the best dishes I ever ate. If she made it, it was going to be good. We had no problem “cleaning our plate,” and often we made room for seconds. 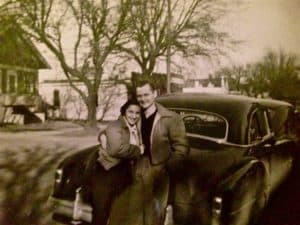 My Grandparents where dating in this picture. This is one of my favorite pictures of them. Dinner usually included a meat or casserole, vegetable, starch, salad, bread, and milk. For her, it was not a full meal without all of these. Grandma served it Family Style with everything placed in the center of the table to be passed around. I miss these moments. I didn’t realize how special those times were. 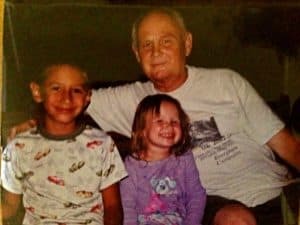 My Grandpa passed away two years ago. Grandma sold her house and gave away the table that I, all my mother’s side of the family, my brothers, and my children grew up sitting around. My grandparents had their house for over 55 years. It was a constant in my life. I am thankful for the family time and memories we shared at dinner. I am thankful my children were a part of those moments. I am sad that those days are passed. The family still gets together. But the house that “built me” belongs to someone else now. I hope I give my children and grandchildren the same special experiences. Food with love. Food for the soul. 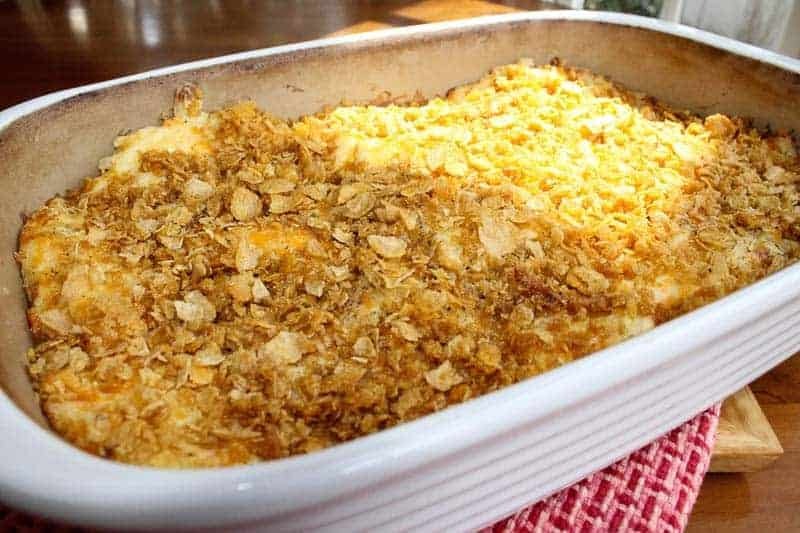 This easy Hash Brown Casserole with cornflakes is one of my favorite dishes my Grandma makes. I have several others that I love, but I made this recipe recently, so I am sharing this with you first. As I said, my grandma’s dinner table was always full, so this recipe feeds many. Don’t worry, left overs are good too! 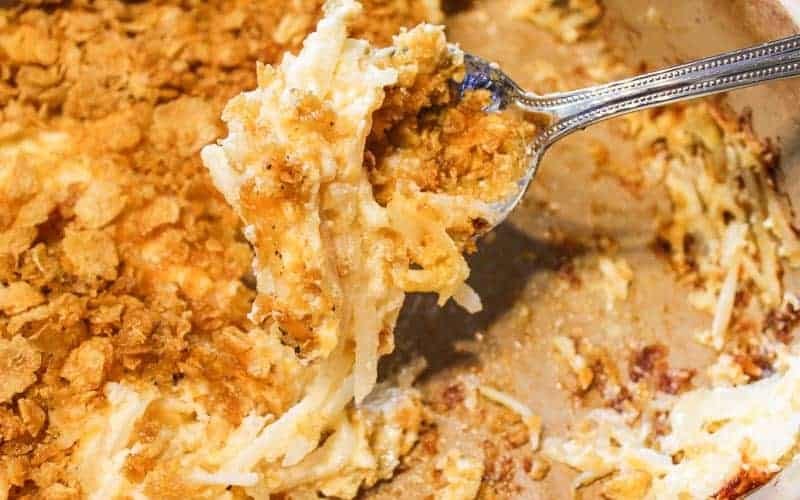 She always made this easy hash brown casserole for dinner, but it also makes a great side dish to add to your breakfast and brunch entertaining. Serve it with my Raspberry French Toast Casserole and Southern Living’s Breakfast Enchiladas and you have an AMAZING breakfast menu! If you like this recipe, check out Granny Moore’s Dressing, Candy Bar Cream Cheese Fruit Dip, and Crock Pot Pepperoncini Pot Roast. Melt butter. Mix butter with cornflakes. Set aside. Mix remaining ingredients in a large bowl. Place potato mixture in a 9x10 baking pan. Top with corn flake mixture. I LOVE this recipe. All time favorite for almost any meal. Thanks Katie for this one! very interesting recipe.. would love to try the vegetarian version. I’ve never encountered a dish like this, it’s not something I’ve seen in the UK, so one I definitely need to try soon! Love the use of cornflakes on the top! What a beautiful story! It sounds like you have a very loving and close-knit family. My husband loves hash browns, so I can’t wait to try your recipe! Grandmas make the best food, don’t they! I love the sound of the corn flake crust on top too. This looks delicious. Thank you for sharing the story too!